About - Stat Bio-Medical Sales & Service, LLC. Our highly trained team has over 60 years of combined experience. Founded by owner Bill Peloquin in 2002, Stat Bio-Medical Sales & Service launched with one goal in mind: to provide our clients with comprehensive bio-medical equipment services. From sales of brand new and reconditioned (used) equipment to scheduled maintenance, emergency repair, and servicing of bio-medical equipment in medical offices, clinics, surgery centers, and hospitals, Stat Bio-Medical Sales & Service offers unmatched customer service from contact to delivery. We will have your equipment up-and-running as quickly as possible to reduce downtime and ensure compliance. Our team is trained and certified to work with the top brand names of bio-medical equipment in the country and we are proud to serve as the exclusive North East USA authorized distributor for Pronk Technologies. Our mission is to be the best bio-medical service company in the Greater New England area, while providing services that exceed the standard guidelines set by OSHA, JCAHO, CLIA and NFPA 99. We pride ourselves in helping our clients to keep their medical equipment in fully operational and provide all of the required documentation for federal inspection. The safety of your patients and staff is our number one priority. Contact our team direct to get a FREE quote for any of our bio-medical sales and services. To best serve our clients, Stat Bio-Medical Sales & Service offers a wide range of opportunities for the ongoing servicing, preventive maintenance, and repair of essential bio-medical equipment. We offer professional services related to the performance of electrical safety inspections, as well as preventative maintenance and calibrations. In addition, we provide sales of new and reconditioned (used) equipment. For 23 years, Bill was a dedicated employee at the 102 nd FW in Avionics at Otis Air National Guard Base. In 1999, his time with the National Guard came to an end. He then started Physician Sales & Service (PSS) in the Bio-Medical Repair Department. In 2002, he left PSS and created STAT Bio-Medical Sales & Service. For the past 15 years, he has been building STAT Bio-Medical to be the number one Bio-Medical repair provider to the healthcare facilities throughout the North East. He is devoted and focused in providing outstanding services while maintaining strong customer relationships. Bill is certified in Midmark, Tuttnauer, Burdick, Welch Allyn, GE, Philips, Olympus and Pelton & Crane. After studying Business Management at Bristol Community College Amber became the Office Manager for Stat Bio-Medical. For the last 6 years, she has been organizing and managing all office operations and procedures. She is responsible for overseeing the functions of Human Resources, developing office systems and supervises staff, while handling accounts payable, accounts receivable and customer relations. She thoroughly reviews billing to ensure they are in accordance with contracts and purchase orders. She oversees all aspects of business planning, research development, marketing, as well as sales and service. Amber is focused on providing excellent service to healthcare facilities throughout New England. After serving 4 years of active duty in the United States Marine Corp., he graduated from UMASS with a Bachelor of Science in Electrical Engineering. Thatcher was the Bio-Medical Service Manager of Physician Sales & Service (PSS/McKesson) for 16 years. He solely managed the Bio-Medical Department for 8 years and brought on a trainee for the remaining amount of time. He pioneered the CVS Minute Clinic Program and was in charge of service and maintaining numerous large accounts including Harvard VanGuard, Harbor Medical, Signature Healthcare, Atrius Healthcare, Dedham Medical and South Shore Medical. After PSS/McKesson decided to close their doors on the Bio-Medical Repair Department in April of 2016 he joined the Stat Bio-Medical Team. Thatcher is certified in Midmark, Tuttnauer, Burdick, Welch Allyn, GE, Philips, Olympus and Pelton & Crane. In addition to preparing daily schedules and Electrical Safety Testing reports, Heidi manages customer relations and handles customer inquiries. She also generates work orders for service and repair calls to ensure that all equipment is functioning properly and inspections are completed in a timely manner. Paul is a Bio-Medical repair technician. He performs preventative maintenance, calibration, repairs and onsite maintenance. He is certified in Midmark, Tuttnauer, Burdick and Welch Allyn. Jesse is an important part of our Bio-Medical repair team. He is a complete technician who performs electrical safety testing, preventative maintenance, calibration, repairs and onsite maintenance. He is certified in Midmark, Tuttnauer, Burdick and Welch Allyn. Charlie helps assist in Electrical Safety and Preventative Maintenance Inspections. He is the lead technician on all Dornoch repairs onsite and is certified in Midmark, Tuttnauer, Burdick and Welch Allyn. Charlie completes the team, enabling the daily functioning of our company. 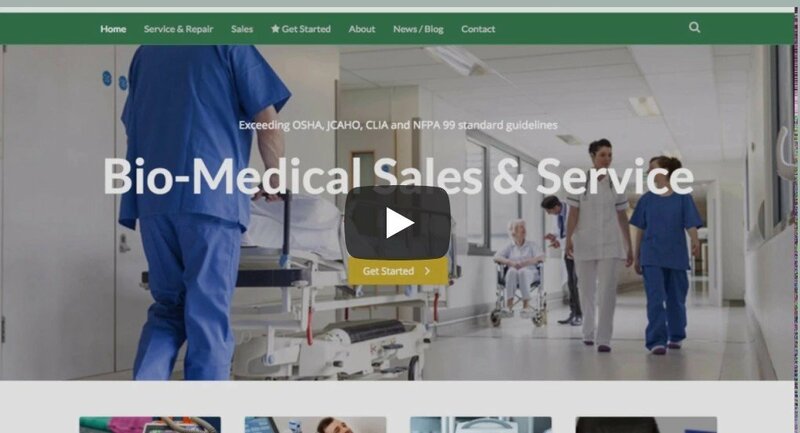 At Stat Bio-Medical Sales & Service, we are always looking for new ways to improve the services that we provide to our clients, such as our Client Access Portal, a powerful tool designed to help clients check the status of servicing and repairs. Instead of relying on standard "off the shelf" software systems that were designed for use in other industries, we have designed a custom system to help us provide our clients with services that will meet or exceed their expectations.